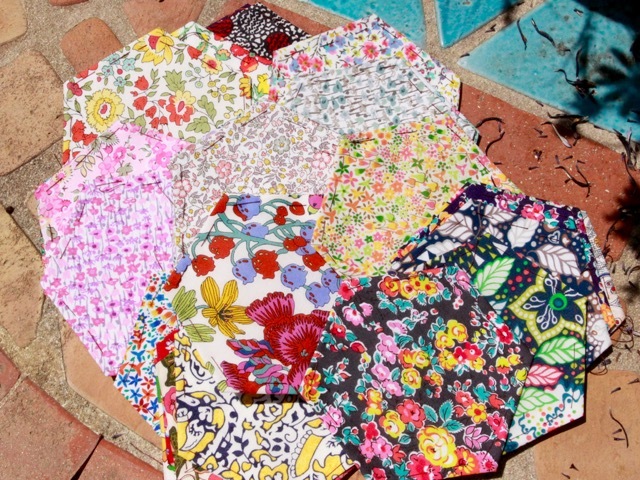 Still inspired by spring flowers and floral fabrics! 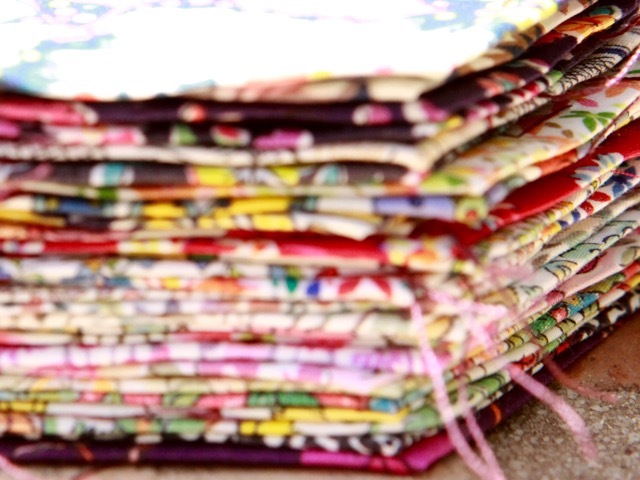 Using some scraps from my Liberty stash I started to cut and prepare hexagons with the purpose of making a pillow. In the garden the iris are wonderful and the wisteria fabulous this year. This is the view I have from my bedroom window in the morning opening the shutters, and the truth is that it influences my mood positively for the rest of the day! 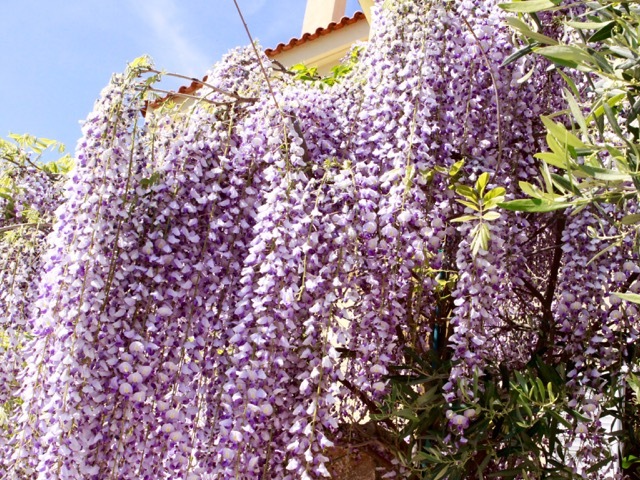 The wisteria flowerheads can reach one yard long! They look like a lace curtain, and moving with the wind they exhale a delicate perfume. 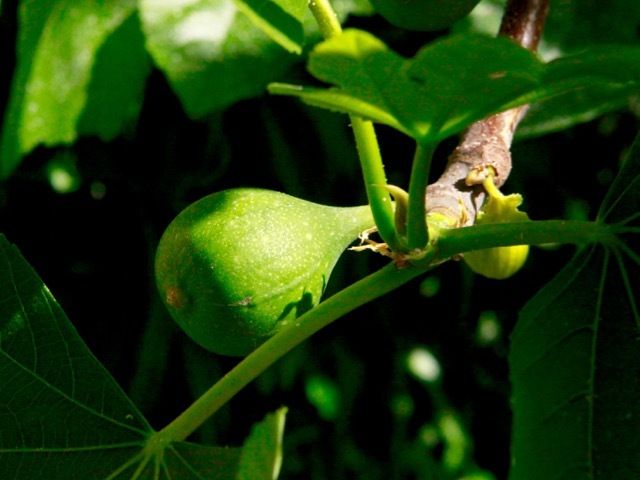 On the left of my window is the fig tree and every morning new little figs appear! 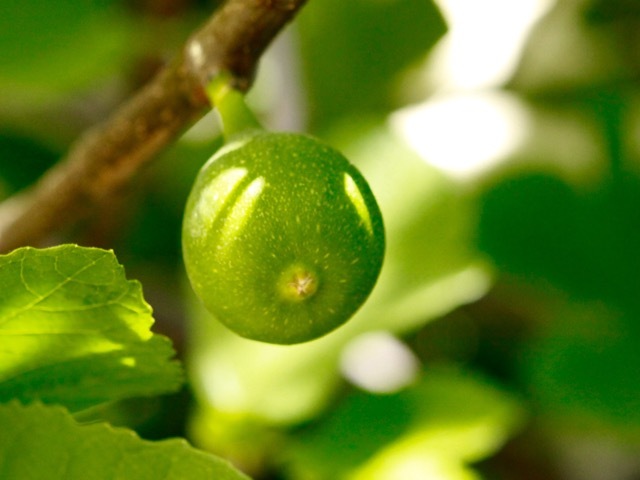 Nature is really miraculous and so inspiring for quilting or painting! Hexies look fab. I grew up with wisteria in my parents garden. They are spectacular. I love their soft seed pods. 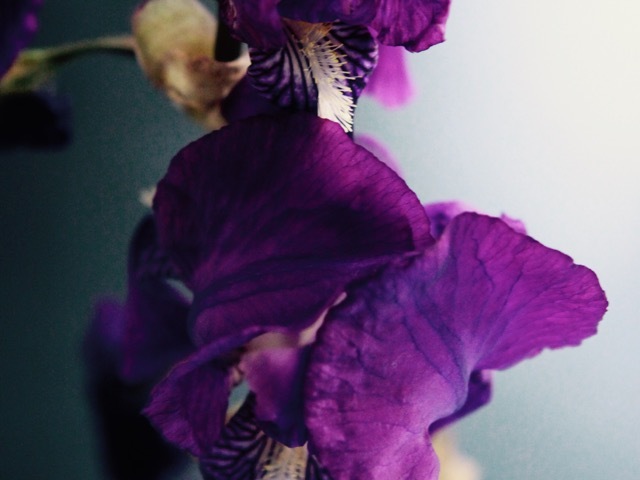 Your Iris is also an amazing colour. I dream of sitting in your garden one day sipping tea while stitching and visiting with you. It looks like a tiny slice of heaven! I can only imagine what you make with those hexies, and I look forward to the updates! Your photos take my breath away. 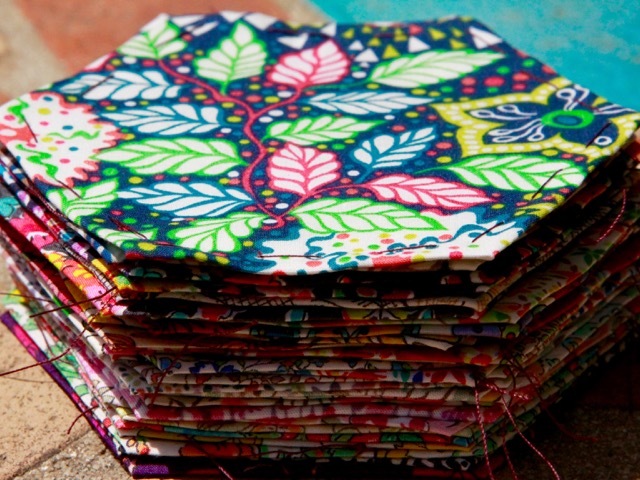 I love those Liberty hexagons, Christine, and the wisteria is absolutely gorgeous! Beautiful post, thank you! Wow! beautiful hexies and that wisteria is amazing! Your hexies seem to be beautifully inspired by your garden. As you describe the wisteria, I can almost smell it. So pretty! Wow those purple flowers!! Loving your little hexies too. Your fabric choices are always spot on! Your photos are so lovely Christine... I almost feel like I can smell the wisteria fragrance in the air. Your hexagon project is going to be beautiful! Quel bonheur de pouvoir ouvrir ses volets devant de telles beautés.....Tu as bien de la chance !! You have my idea of heaven right outside your bedroom window Christine!! What a beautiful courtyard, I can picture myself sitting at the table surrounded by the flowers and of course the lovely golden stone wall you have. To cap it all off - in Greece!! You are so fortunate to have such beautiful flowers in bloom. 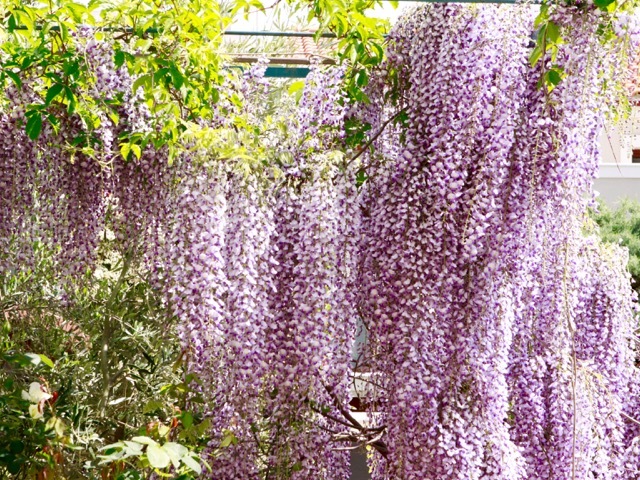 Wisteria's are beautiful, I have one and love it! My neighbour too, and my Wisteria continue a few meters on top of her fence. Looks like our gardens are one! 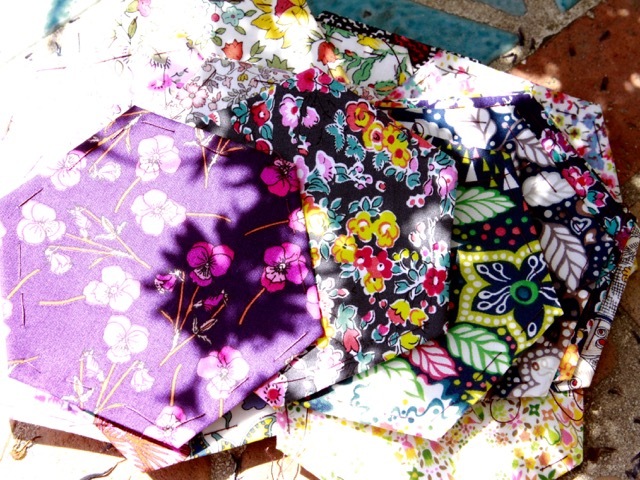 I'm in a hurry to see your new quilt ....Your fabrics are so beautifful....and thanks for all these pictures of your garden....Spring is a so lovely season! Thank you Laurence for your visit and kind comment! 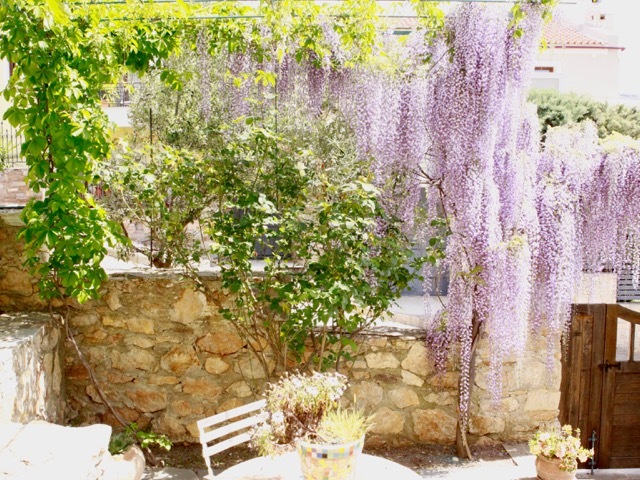 Seeing that gorgeous wisteria outside my bedroom window would make me cry...in a very good way. Wow! This is a wonderful post, Christine! From the fabrics to the flowers, everything is so pretty. What a gorgeous flowers! You're so lucky to be able to see such beauty every morning. Your blog is very inspiring. Thank you!